On Thursday, during qualifying for the Rolex 24 at Daytona, the Mazda Team Joest No. 77 driven by Oliver Jarvis landed on the pole position, and in the process broke the lap record for the track. That record had stood for 26 years, set in 1993 by the powerhouse AAR Toyota team. Now you can see just how manic that 1 minute 33.68 second lap was from inside the car with this full onboard video. This feat is all the more impressive when you consider where the Mazda team has come from. This IMSA prototype effort began for the Japanese manufacturer five years ago when the team qualified dead last on the grid for the Daytona 24 in 2014. Not last in the prototype field, but last even behind the GT cars. By changing the engine, chassis, tire manufacturer, driver lineup, class regulations, and swapping Speedsource for the Le Mans-winning Team Joest, Mazda has gone from worst to first. 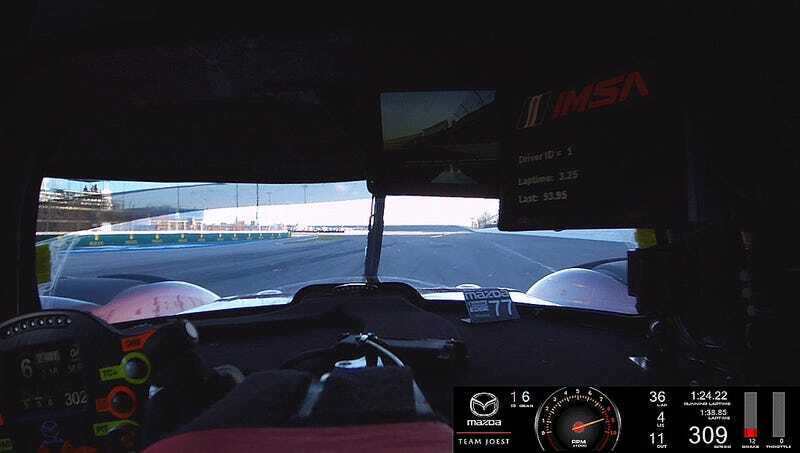 Mazda’s qualifying time at Daytona in 2014? An incredibly slow 1 minute 49.734 second lap. In five years, with all of those changes, the Mazda prototype effort have “found” 16.04 seconds. That’s a mighty impressive feat, and deserves praise. Now to see if the team can hold everything together and produce that kind of speed during the 24 hour race this Saturday.